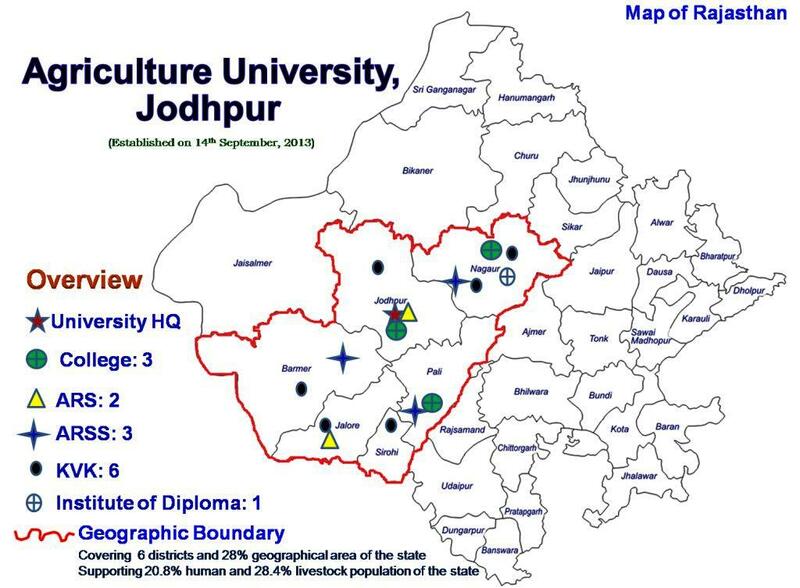 Agriculture University, Jodhpur was established on 14th September, 2013 by Government of Rajasthan under Agriculture University, Jodhpur Act 21 of 2013 to focus on holistic development of arid and semi-arid regions of the state covering 6 districts (Jodhpur, Barmer, Nagaur, Pali, Jalore and Sirohi), constituting 28% of total geographical area which is sustaining 20.8% human and 28.4% animal population of the state. The districts under jurisdiction of the university cover 3 agro-ecological zones of the state. These are Arid Western Plain Zone Ia (Jodhpur and Barmer districts), Transitional plain of Luni Basin Zone IIb (Jalore, Pali, and Sirohi districts) and part of Transitional Plain of Inland Drainage Zone IIa (Nagaur district). The university has 1 institute of diploma and 3 colleges to produce highly competent educated human resources in agriculture and allied sciences besides 2 agricultural research stations, one each in zone Ia & IIb and 3 agricultural research sub stations, one in each zone to prepare, plan and perform highly need based research in this acute water scarce but naturally rich bio-diversified zone of the country. The third most important part in tri-pillar (Teaching, Research & Extension) of agricultural development, the extension for transfer of technologies are reached to doorsteps of the farming community by 6 Krishi Vigyan Kendras (K-V-Ks), 2 in Nagaur district and 1 each in Jodhpur, Barmer, Jalore & Sirohi districts under the umbrella of the university. The different units of teaching, research and extension are coordinating to systematically run by the headquarter situated at Mandor, Jodhpur. From Airport, Jodhpur 12.8 k.m. From Railway Station, Jodhpur 10.1 k.m. From Railway Station, Mandor 850 m.
From Roadways Bus Stand, Jodhpur 8.2 k.m.